Wanting to get up early on our last day, we had set an alarm for 8am, but neither of us felt like getting up, so we continued snoozing until 9:00. It rained during the night, which had woken both of us up a few times, but we both had slept well. Andrea was very happy with the Therm-a-Rest NeoAir X-Lite, and I felt the same regarding the Big Agnes Q-Core SL. Both kept us well-insulated, and neither of us had sore hips. The NeoAir X-Lite inflates to 2.5” thick, the Q-Core to 3.5”. Although the NeoAir is known to be a noisy mattress – it has a heat-reflective layer that causes the mattress to crinkle when it's moved – once a sleeping bag is on top of it, the noise is deadened and is not much of an issue. Regarding the Q-Core, on the first night it was warm enough that I tried sleeping with my sleeping bag open and draped over me like a quilt. I'm normally a cold sleeper, but I was comfortable all night and never felt the cold, hard ground. When I was researching new mattresses before making a purchase, I read some reviews that claimed this pad is difficult to blow up, especially when you're already winded and tired from hiking a long distance. It does take me about 2.5 minutes to inflate, but it is not difficult, and the comfort is definitely worth it. (I say this knowing that this trip consisted of short, easy hikes. I will see how I feel after my next trip.) Both of these pads (especially the NeoAir X-Lite) pack down to a very small size, saving a good amount of space. Also helping me save space on this trip, I tried an inflatable pillow, which I had refused to consider in the past. It just seemed uncomfortable and that a person's head would roll around on it like a beach ball. I bought a Cocoon Hyperlight Air Core pillow, which is about the size of an apple when packed in its stuff sack and weighs practically nothing. This trip may have converted me, but I need more time with it. It was actually pretty comfortable - my head did roll a little on it, but as long as I under-inflated it a bit, my head was pretty well-cushioned and didn't move too much. When stuffed, it's about 1/4 of the size of my Therm-a-Rest pillow, so I will be taking it on my next trip for further testing (8 days at Isle Royale in September). We packed everything up and headed to the beach to make breakfast. It was still cold, but the sun was shining and the fog was finally gone. We sat on a rocky ledge and made oatmeal while watching the lake. After breakfast, we explored the beach again, seeing things with a new perspective thanks to the sunlight. The formation near the beach's eastern end held our fascination for a while. It has a curved turret on top, and a small cave has been carved into the side facing the lake. It was difficult to leave Mosquito beach, but we headed back to the trail around 11:00 am to begin the hike back to the trailhead. This leg of Chapel Loop – Mosquito Falls Trail – is serene and very pretty. We are familiar with this trail from past visits, but it is always enjoyable. Everything was a beautiful, rich green, and the woods smelled wonderful. 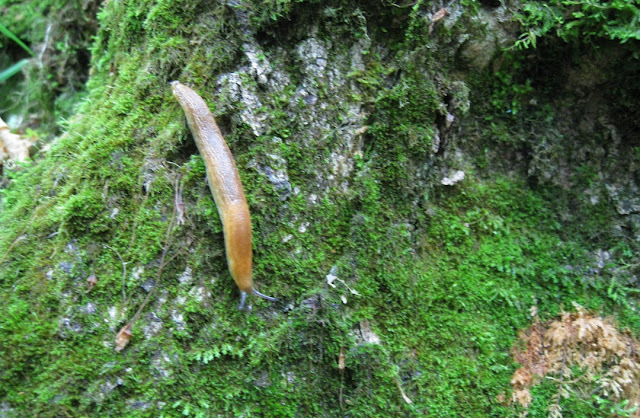 We saw a doe on the trail, but that was the extent of wildlife spotting, aside from a few slugs on tree trunks (originally discovered when I randomly reached out to steady myself while stepping over a log and ended up with a handful of slime). 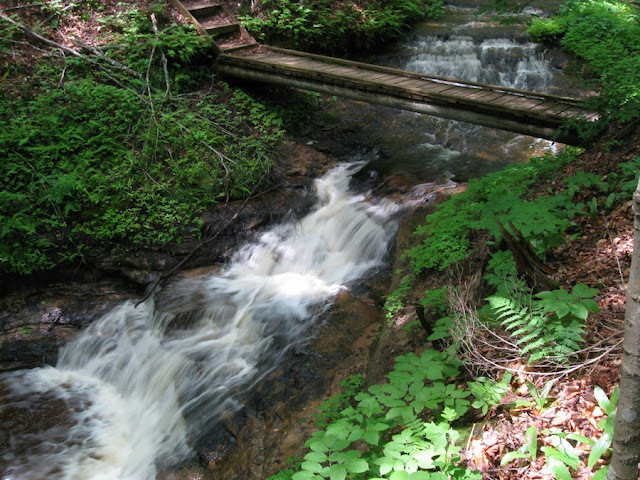 There are four separate cascades along Mosquito River that make up Mosquito Falls. Light filtering through the tree canopy and down to the river and forest floor creates beautiful color and mood. We have also snowshoed this trail in winter, which is another beautiful time to see the river. The trail is not blazed, however, so it could be easy to get lost when covered with snow. Once we reached the second cascade, we began to see people. It is a short hike from the trailhead parking lot to the falls, and now that it was Saturday, groups of day visitors were making their way down the trail. We reached the trailhead around 2pm. When we first arrived on Thursday, ours was one of only two cars. Now the parking lot was full. We headed back to Munising and ate pasties at Muldoon's before beginning the drive back down-state.